Bavaro is among the most vacation-friendly areas in the beautiful Dominican Republic. Its beaches are some of the softest and most beautiful in the Caribbean, so why not make the most of your stay by booking one of our Bavaro beach resorts? You'll have the warm Caribbean Sea at your doorstep, making for an unforgettable escape. Although your average search engine will yield a ton of beachfront resort choices, it will take a lot of time to determine their suitability and quality. If you use Vacatia's custom search tool, however, you'll be able to find high-quality lodging quickly and easily. We only include highly recommended accommodations in our database, so you won't have to worry about unpleasant surprises upon your arrival. You'll also be impressed by our responsive customer service, including our Guest Care team who can be contacted via online chat. You've settled on Bavaro for your next holiday, and now it's time to book accommodation. This can be a bit of a tricky process, given the variety of lodging available in Bavaro. 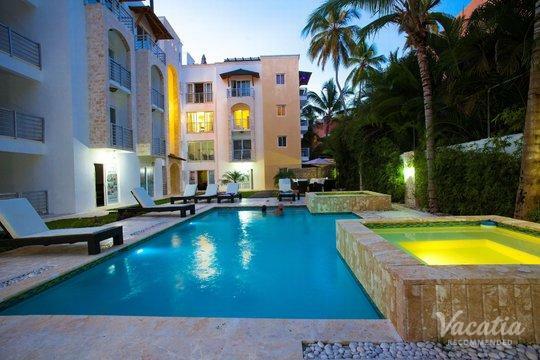 Resorts and high-end hotels are in the majority, but what about condo and vacation rentals? Luckily, Vacatia is here to simplify the process. When you book one of our resort residences, you get the best of both worlds: the comforts of home and the luxuries of a resort. You can cook in your own complete kitchen for a low-key meal or snack, or you can head down to the on-site gourmet restaurant for a sumptuous treat. You can spend the day soaking up the sun while the housekeeping staff take care of the chores. 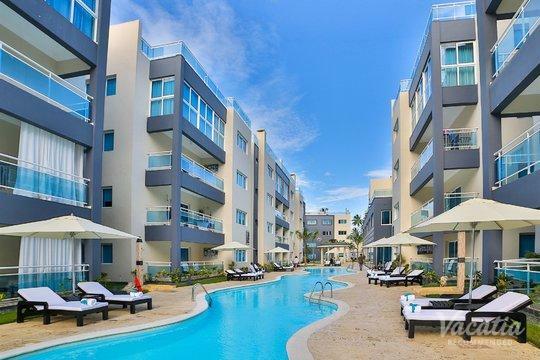 You can reflect and recharge in a well-furnished living room at the end of each incredible day in Bavaro. Bavaro is located on the Dominican Republic's east coast, and it is a vacationer's playground of sun and sea. Luxurious resorts and hotels offer access to stunning beaches, which are among the best in the Caribbean with their incredibly soft sands and warm turquoise waters. You'll find yourself enjoying your idyllic escape among the other sun worshippers as you make lifelong memories. With well-maintained amenities, you'll have a smooth and relaxing experience. Bavaro is where most of the beaches in the Punta Cana area are found. This locale is home to commercial plazas, as well as the strip of shops known as El Corecito. You can head to a golf course that looks out onto the Caribbean Sea, book a dune buggy tour, enjoy tasty local cuisine, or explore the stunning Indigenous Eyes Reserve.